The kitchen is the most important room of our house. It sees the most action at all times of the day, from being an office, to a homework station, a place to entertain as well as cook, it is essential we get our planning right for it to be a functional and pleasant space to work in. 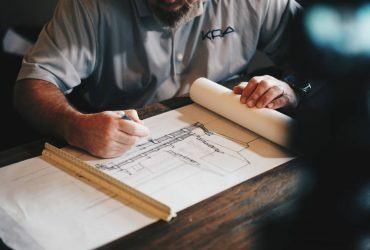 Let’s take a look at what it takes to get your kitchen plan right. 5 Tips to Help Plan Your Dream Kitchen. 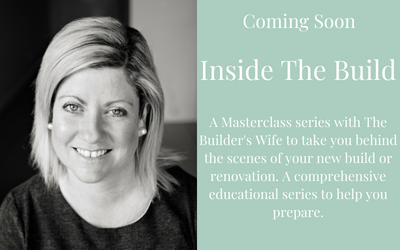 Spend a couple of weeks looking at how you use your kitchen. Is it a multi function space, or do you use it only for cooking and food preparation? Are you like us and entertain from the kitchen, is it somewhere your kids do their homework? I spend a LOT of time in the kitchen, therefore we need an island kitchen, so that their is plenty of space for the kids to spread out and do their home work. My Dad doesn’t entertain from his kitchen, therefore a gallery kitchen works best for him. How does your space implicate how you use your kitchen? Do you need to create a little extra room so that you can have a U shaped kitchen, or is a galley ok for you? Perhaps an L shaped kitchen will work in your home. I cannot recommend maximising bench space enough. Look at ways you can get your microwave off the bench. Will an island bench work in your design? For a kitchen to work to its highest ability, bench space is a must! Do you really need the 900mm oven and cooktop, or can you do with a smaller 600mm to give back that extra bit of bench space. Carefully choose a sink to maintain your available bench space. Find ways in the design stage to keep your benches clutter free. Consider a herb storage draw, or an extra draw near your oven for utensil storage. Your bench is precious real estate you wont want to lose. What are you using your kitchen for? Is it simply a space to cook? The fluorescent lighting is best. 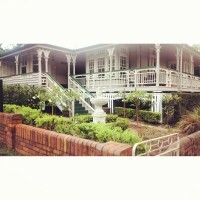 Is is a family hub, where you will entertain, cook, do homework and enjoy each others company? Then take a little more time to plan your lighting choices. Consider using a combination of lighting styles to cover all uses of the space. We have bright lights for when we are cooking and then use a lamp at other times. Recent kitchen design has seen under bench lighting for helping to create the mood. Don’t forget a beautiful feature light for over your island bench! Clever storage solutions are a must when planning a kitchen. There are literally hundreds of clever ideas designed to help you maximise space and minimise effort when in the kitchen. We had a spice draw directly under our cooktop in our last house, that is first on the wishlist for my new kitchen, along with a utensil draw close by. We will also have a charging station for our phones and iPads. 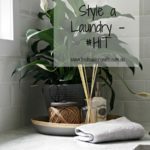 Take time to visit a few kitchen show rooms, and you local Bunnings and Ikea for some really great storage ideas and adopt as many as you can. 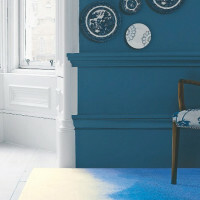 As always with any element of design or decorating, have fun and don’t be afraid to let your personality shine through. Have you ever designed a new kitchen? What clever storage solutions have you seen? 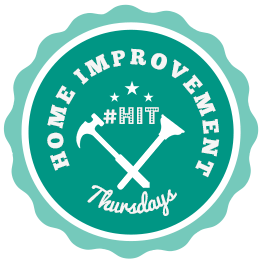 Welcome to #HIT or Home Improvement Thursdays. Anyone can join in, no matter the niche of your blog, just as long as your linked post follows the few simple rules. 1. 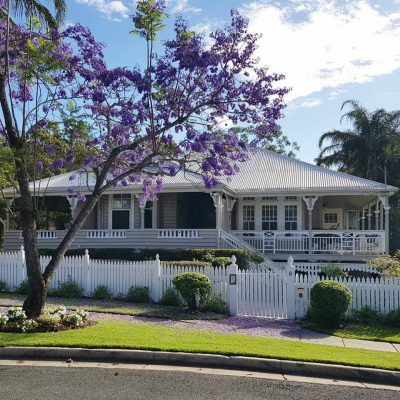 Linkable posts, must centre around the topics of DIY, Renovations, Home Organisation, Home Improvement, Home Makeovers, Home Styling, or Home Maintenance. 2. You can share 1 post each week. Please make sure they are new to the “Home Improvement Thursday” party. 3. Linking is simple, find the little blue button at the end of the post that says, Add Your Link, and then pop in your URL, and follow the prompts. Your link only needs to be added once and it will automatically show up on both of our blogs… it’s that easy! 4. Grab our #HIT button and pop it on your sidebar. Don’t forget to share it with others. 5. Follow the blogs of your fellow #HIT family, and leave a comment. Please visit and comment on at least three blogs that are near you on the list. 6. Leave a comment on the post below so we can return the favour and comment on your post. 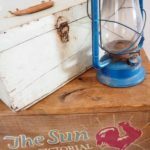 *Each week Bec and I will feature one of your posts onto our social media pages. 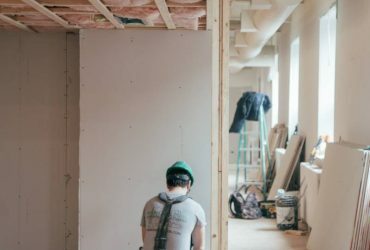 By adding your link, you are giving The Builder’s Wife and The Plumbette permission to post one photo from your post with a link back to the full post for future roundups on our blogs and possibly share your image and link on social media. Jarah Jungle gave us a great DIY Post on How to Install Metal Support Poles For a Shade Sail. 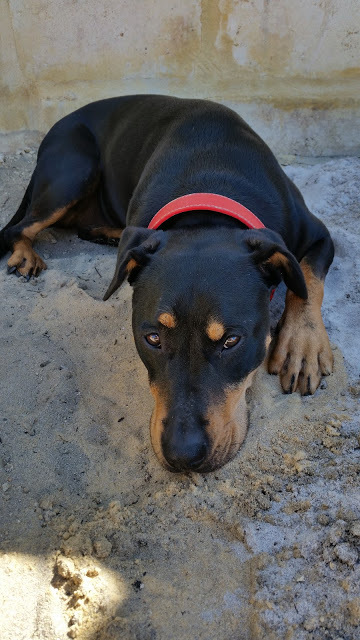 With their trusty site supervisor Lexi watching over, the job is sure to be a success! 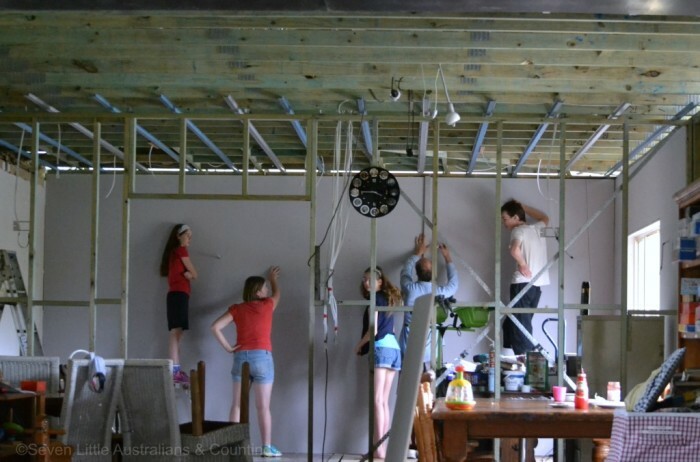 Erin from Seven Australians and Counting shared how Their Library Is Taking Shape. I love that all the kids are helping out and learning at the same time! 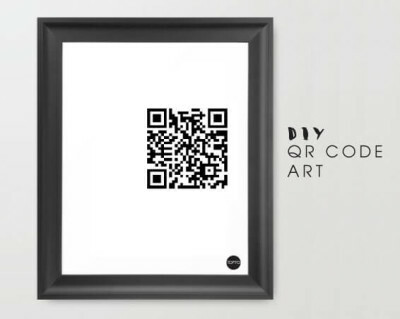 Sarah at TOMFO shared her awesome idea, Creative Uses for QR Codes. I can see some unique gift ideas coming my family’s way thanks to this inspiration. Our kitchen is the hub of our living space too because of our open plan design. We have quite a bit of bench space but there are things I would change in our kitchen. Like not having the microwave installed at child level and rearranging the set up at the back wall. Overall I’m happy with it. I’d love to design a new kitchen just for the sake of the challenge of it. Our microwave is at kids level too, and now that the kids are older, it actually works really well, but I can imagine what a drama it would have been when they were little! I cannot wait for my new kitchen, our is so poky and small. Great advice Nicole. We have a big island bench in our kitchen that everyone gathers around – I have a hard time getting them to go and sit in our lovely lounge room. Love those drawers in the final pic. Some other advice I’d offer is not to have the cooktop on the island bench – I think it’s dangerous because people sitting at the island can touch it (ie kids) and I don’t know why people do it. If there’s anywhere else for cooktop to go, get it off the island! YES! Do you know that our current kitchen has a cooktop on the island bench and I hate it!!! There is nowhere for our kids to sit and keep me company while I cook for them. There is space for our to be where the oven is, I have no idea what the previous owners were thinking!! The person who had our place before did their best to maximise the bench space by installing the tiniest sink in the world which makes washing up quite a splash fest. Space wise, it was a bit of a false economy! If or hopefully, when, our kitchen gets it’s extreme makeover, I’m going to be referring back to these tips! Great tips!! 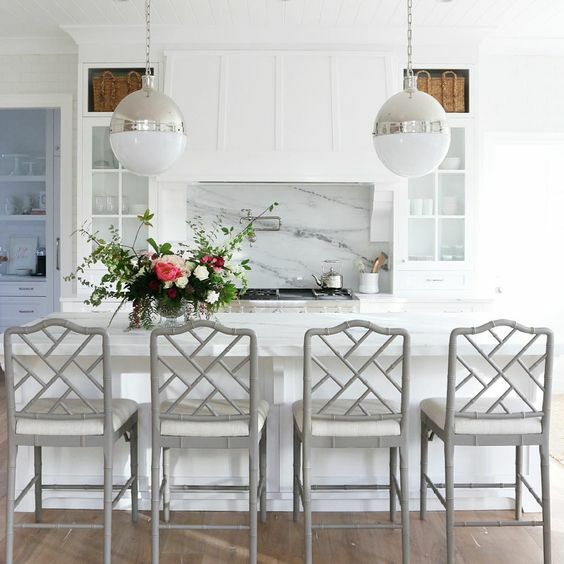 I love my kitchen however I am swooning over these white kitchens! So gorgeous! Leanne from Lime & Mortar has a gorgeous kitchen! 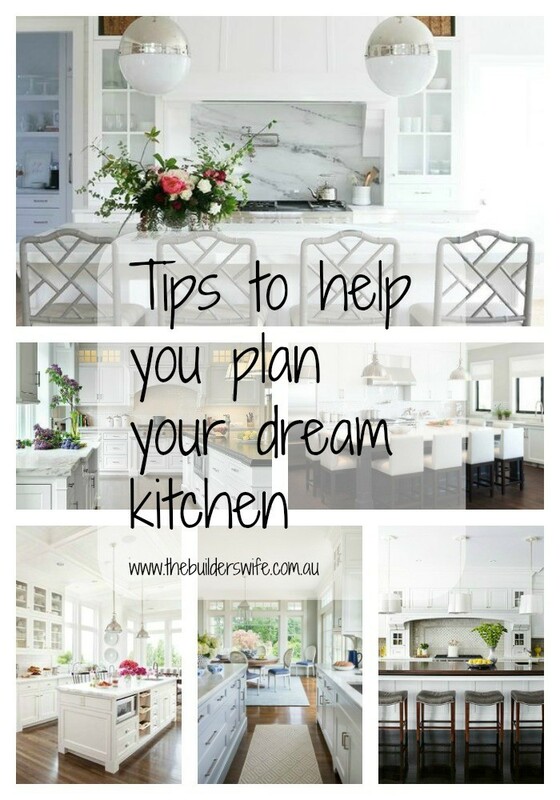 These are fantastic tips for that one day when I can finally get my dream kitchen! My kitchen will be built around my oven which will be at least 900 wide! Until then I just dream about beautiful clean lines and crisp pictures of other peoples kitchens! Which just quietly are typically the size of half my house! Throwing in my experience for you to mull over. Until recently we had a 900 wide smeg oven. Several months ago it died, for now we’re using a little plug in bench oven. In one quarter our electricity bill went down by $300!! When we build our new kitchen we’ve decided that we’re going to put in a double westinghouse oven instead. I have no idea what my dream kitchen would look like – a few key features it would need though is : lots of natural light, a butlers pantry. STORAGE and I love the look of a glass window as a splashback. Looks great and lets all the light in! I’m a bit concerned that the kitchen isn’t large enough, well that is it seems large enough to do all I want it to do but it’s small for a kitchen the size of our house. Should I be concerned? But in all the planning and talking to various women about their needs and wishes I’ve come to the conclusion that many people overlook a vital factor when planning. The truth is that every family has different needs and uses their kitchens differently, as you share regards your family and your Dad. I’m believing this needs to be stressed as much as the triangle. For example my friend who buy organic grains in bulk needs a walk in pantry with sealable storage. For me who predominately eats fresh fruit and veg and meat, our focus is more on large fridge and freezer space. A family who eats alot of processed foods needs more pantry space than I do. I’m sure this makes sense to you but I wish it was stressed more. 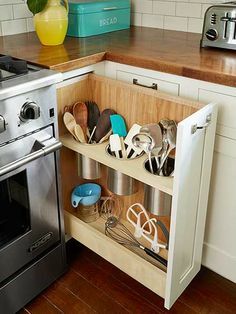 I love that pull out utensils drawer and spice drawer idea. Very cool. My aunty recently installed a new kitchen in her home and I was impressed with the designs available these days to help people reach and access those difficult to reach spaces like the corner cupboards. I home one day I get the opportunity to design my own kitchen. What fun. Great timing Nicole, I’m in the midst of designing our new kitchen. I love Erin’s point about really designing it for how you live, it’s easy to get caught up in having things a certain way just because it’s the current trend. A space for everything is my plan, I’m obsessed with all of the internal drawer organisers you can get but geez they bump up the price pretty quickly! I love these tips, storage and the triangle are the bomb. Oh and bench space, I reckon you can never have enough. Your tips are great & really useful. Glass splash backs are very suitable thing for kitchen because of its shine kitchen look more beautiful.